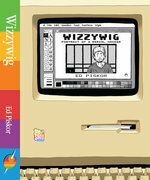 Wizzywig is Ed Piskor’s first “real” solo release. In between doing this book, he has drawn a few others, Macedonia and The Beats. Both of those were written by the late, great, Harvey Pekar. Ed’s also designed characters and produced art for an Adult Swim show on Cartoon Network. Right now Ed’s finishing another, albeit looser, book called Deleterious Pedigree which can be seen at wizzywigcomics.com. He also does a weekly comic strip online at the notorious hacker-friendly website, BoingBoing.net, called Brain Rot.